Download the master list of prescription discount cards. The Juniata County Commissioners proudly present the Prescription Discount Card Program to benefit all residents of Juniata County. The program is sponsored by the National Association of Counties and CVS Caremark, a leading health care provider. The Prescription Discount Card Program is not an insurance program. There is no enrollment form and no membership fee. All you have to do is present your card to your local pharmacist to start saving right away. Any prescription that is not covered by your existing insurance program may be discounted through this program. Prescription Discount Cards are also available at many locations across the county, including the Mifflin-Juniata Area Agency on Aging office, Senior Centers, Juniata Valley Tri-County MH/MR Program, County doctor’s offices, and local pharmacies. County residents may begin using the discount prescription cards right away to save 20% or more on prescriptions and many diabetic supplies. To find out if your prescriptions are covered, call your local pharmacist, or to speak with a Customer Care representative, call toll-free 1-877-321-2652. Ask about the Mail Order Direct program for even more savings and convenience. Savings are possible with other pharmacy discount cards. To find one that provides the best savings for your situation, please check out our list of prescription discount cards. 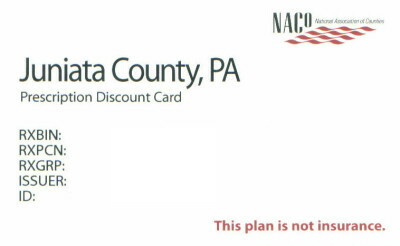 The National Association of Counties (NACo) has launched a Dental Discount Program to help residents in member counties. Juniata County has agreed to be a part of a pilot to test the program. The program will provide residents in Juniata County with cards that will save from 5% to 50% on a full complement of dental services. The cards will cost $59 a year for individuals and $69 a year for families. Careington International will offer a comprehensive dental discount program at special reduced rates. This new dental discount card program is now available for county residents. As a NACo member, Juniata County offers this program to help uninsured and underinsured county residents save money on their dental service expenses. Save 5% to 50% on dental procedures including routine oral exams, cleaning, dentures, braces, crowns, x-rays, root canals and more. If you would like more information about the Dental Discount Program, please go to www.nacodentalplan.com.